Despite the well-recognised benefits of sport, there are also negative influences on athlete health, well-being and integrity caused by non-accidental violence through harassment and abuse. All athletes have a right to engage in ‘safe sport’, defined as an athletic environment that is respectful, equitable and free from all forms of non-accidental violence to athletes. Yet, these issues represent a blind spot for many sport organisations through fear of reputational damage, ignorance, silence or collusion. This consensus statement extends the 2007 IOC Consensus Statement on Sexual Harassment and Abuse in Sport, presenting additional evidence of several other types of harassment and abuse—psychological, physical and neglect. All ages and types of athletes are susceptible to these problems but science confirms that elite, disabled, child and lesbian/gay/bisexual/trans-sexual (LGBT) athletes are at highest risk, that psychological abuse is at the core of all other forms and that athletes can also be perpetrators. Harassment and abuse arise from prejudices expressed through power differences. Perpetrators use a range of interpersonal mechanisms including contact, non-contact/verbal, cyber-based, negligence, bullying and hazing. Attention is paid to the particular risks facing child athletes, athletes with a disability and LGBT athletes. Impacts on the individual athlete and the organisation are discussed. Sport stakeholders are encouraged to consider the wider social parameters of these issues, including cultures of secrecy and deference that too often facilitate abuse, rather than focusing simply on psychopathological causes. The promotion of safe sport is an urgent task and part of the broader international imperative for good governance in sport. A systematic multiagency approach to prevention is most effective, involving athletes, entourage members, sport managers, medical and therapeutic practitioners, educators and criminal justice agencies. Structural and cultural remedies, as well as practical recommendations, are suggested for sport organisations, athletes, sports medicine and allied disciplines, sport scientists and researchers. The successful prevention and eradication of abuse and harassment against athletes rests on the effectiveness of leadership by the major international and national sport organisations. Sport has long been recognised as a major contributor to positive health and well-being for participants. Nonetheless, the risk of sports-related accidental injury is widely acknowledged, especially for elite athletes, resulting in the evolution of a sophisticated research and practice community to mitigate this risk.1 ,2 Less well-recognised is the potential negative influence on athlete health and well-being if his/her integrity is challenged by non-accidental violence or maltreatment through harassment and abuse.3 ,4 All forms of harassment and abuse breach human rights and may constitute a criminal offence.3 ,5–7 Therefore, there is a legal and moral duty of care incumbent on those who organise sport, to ensure that risks of non-accidental violence are identified and mitigated. Harms caused by harassment and abuse still represent a blind spot for many sport organisations, either through fear of reputational damage or through ignorance, silence and collusion.8 ,9 Research on abuse and harassment outside of sport suggests that sport agencies cannot be complacent about this: there is no good reason to suppose that sport is exempt from the ills of wider society.10 More difficult to assess is whether sport is either more or less prone to such problems, for example, whether sport is especially risky or, conversely, offers any special protection.11 What is clear is that the risk of experiencing psychological, physical and sexual violence rises as the athlete progresses up the talent ladder and performance pathway,12 ,13 and that exposure to an abusive elite sport culture can lead to a range of mental health difficulties14 and other negative impacts (see figure 1). Conceptual model of harassment and abuse in sport showing cultural context, types of non-accidental violence, mechanisms and impacts. ED, eating disorders; PTSD, post traumatic stress disorder; STI, sexually transmitted infections. The cultural context of harassment and abuse is rooted in discrimination based on power differentials across a range of social and personal factors (figure 1). It remains to be seen whether and how far the addition of a non-discrimination clause to the Olympic Charter under Principle 6 in 201515 ameliorates these problems. ▸Bullying—Bullying (or cyberbullying if conducted online) is unwanted, repeated and intentional, aggressive behaviour usually among peers, and can involve a real or perceived power imbalance. Bullying can include actions such as making threats, spreading rumours or falsehoods, attacking someone physically or verbally and deliberately excluding someone. ▸Homophobia—Antipathy, contempt, prejudice, aversion or hatred towards lesbian, gay or bisexual individuals. ▸Neglect—The failure of parents or care givers to meet a child's physical and emotional needs or failure to protect a child from exposure to danger.23 This definition equally applies to coaches and athlete entourages. ▸Negligence—Acts of omission regarding athlete safety. For example, depriving an athlete of food/or drink; insufficient rest and recovery; failure to provide a safe physical training environment; or developmental age-inappropriate or physique-inappropriate training methods. ▸Physical abuse—Non-accidental trauma or physical injury caused by punching, beating, kicking, biting, burning or otherwise harming an athlete. This could include forced or mandated inappropriate physical activity (eg, age-inappropriate or physique-inappropriate training loads; when injured or in pain); forced alcohol consumption; or systematic doping practices. ▸Psychological abuse—A pattern of deliberate, prolonged, repeated non-contact behaviours within a power differentiated relationship.24 ,25 This form of abuse is at the core of all other forms. Some definitions refer to emotional or psychological abuse interchangeably. In this document, we refer to psychological abuse in recognition that the psyche consists of more than emotions. It also consists of cognitions, values and beliefs about oneself, and the world. The behaviours that constitute psychological abuse target a person's inner life in all its profound scope. ▸Safe sport—An athletic environment that is respectful, equitable and free from all forms of non-accidental violence to athletes. ▸Sexual harassment—Any unwanted and unwelcome conduct of a sexual nature, whether verbal, non-verbal or physical. We acknowledge that the science underpinning this document is comparatively young and not yet entirely developed. For example, the predominance of available research is representative of only a few countries, and the experiences of some groups, such as athletes with disabilities and lesbian/gay/bisexual/trans-sexual (LGBT) athletes, is largely unknown. The document therefore focuses only on those areas of harassment and abuse in sport where there is deemed to be a sufficient scientific evidence base, and a prevention obligation that is not already addressed elsewhere (see figure 1). For this reason, the primary types of non-accidental violence in the document are categorised under: psychological harassment and abuse, which we regard as a conduit to other forms, sexual harassment and abuse, physical harassment and abuse, and neglect. Several mechanisms through which harassment and abuse are perpetrated are also discussed. Separate attention is paid to the increased risks of harassment and abuse in the child athlete, the athlete with a disability and the athlete who is LGBT. While each form of harassment or abuse is described here singly, it is important to note that they may also be experienced by athletes in combination, exacerbating negative effects. Psychological or emotional harassment and abuse has been the most recent form of interpersonal violence to receive research or policy attention.35 Sport research into this form of interpersonal violence is even recent with relatively scarce data and formulations based on the parent–child literature.25 There is strong evidence that sexual, physical and psychological abuse are highly correlated.36 ,37 Psychological abuse is at the core of all others since it is impossible to conceive of any form of harassment or abuse that does not also have psychological underpinnings. Sexual harassment and abuse in sport stem from abuses of power relations46 ,47 facilitated by an organisational culture that ignores, denies, fails to prevent or even tacitly accepts such problems.45 ,48 They may thus be considered as symptoms of failed leadership. Definitions are not universally agreed on,49 ,50 but broadly align with those displayed in box 1. Empirical data on the prevalence of physical abuse and forced physical exertion in sport are minimal, with much information resulting from public reporting of incidents. The ‘win/lose’ nature of sports and a culture of athlete idolisation results in a tacit acceptance or normalisation of many types of violence in sports.75–77 This applies especially to the physicality of contact sports, where the athlete's body is considered integral ‘equipment’. Indicators and consequences of neglect include preventable accidents and recurrent injuries, malnutrition, eating disorders, disordered eating, dehydration, mental health problems, psychological disorders, self-harming, long-term illness and secondary disability or death. A range of harassment and abuse mechanisms is evident in the sport context (figure 1), which provides specific mechanisms for such behaviour. These may be conceptually discrete but they frequently overlap in practice. Grooming of young people with a view towards sexual abuse (online and real world) being perpetrated. This may involve contact from individuals who are not known to the child or young person in their day-to-day life. Sending or receiving sexual messages or images, known as ‘sexting’. Receiving unwanted negative content such as hate messages, exposure to sexual and violent content, and proself-harm or proeating disorder/body dysmorphia sites. Risks to an individual's reputation from sharing of inappropriate content and/or from creation of false online profiles and impersonation of an individual. Grooming of young people with a view to perpetuate corruption (online and real world) for match fixing and associated activities, which may breach sports' integrity rules and/or constitute criminal offences. Theft of personal and identity data, which may constitute a criminal offence. Sport cultures that haze are characterised by misogyny and homophobia, tolerance of exclusion, misconduct and discrimination, lack of mutual respect and pride, and by enforced silence to protect group secrets about abuse.119 The secrecy surrounding hazing makes it difficult to measure and quantify. Ethnographic studies provide some qualitative accounts109 ,120 but, by its very nature, it is rare for victims of hazing to speak out, and thus unusual for medical staff and other entourage members to become involved in evaluation or support. Homophobia harms those discriminated against, those who participate in a homophobic sport environment and those who leave sport because of it.134 ,137 Cashmore and Cleland138 report that, in English football, ‘fans habitually use gay epithets to abuse players’. Sheldon Kennedy, who was repeatedly sexually abused by his coach when a junior Canadian professional hockey player said that he was afraid to disclose his abuse because he thought people might think he was gay.139 Denison and Kitchen107 found that the acceptance of LGB in six participating countries was 22.9%. Acceptance was defined as: LGB respondents who were ‘out’ reported it to their entire team, did not witness or experience homophobia, held positive views on safety of LGB with spectators, believed youth sport was supportive and safe for LGB people, and believed LGB people were accepted. Childhood sexual abuse in the non-sport population is a strong predictor of non-suicidal self-injury/self-harm and suicide attempts subsequent to the abuse.158 Harassment of any type, particularly sexual harassment, has been linked to a variety of poor mental health and well-being outcomes, including self-harm, among adolescents. The risk of non-suicidal self-injury/self-harm, suicide attempts and completed suicide increases with the number of harassment types that an adolescent experiences.159 Early detection and intervention, which reduces the incidence of harassment, is particularly important in mitigating mental health difficulties and behavioural self-harm among adolescents.160 Other physical impacts of sexual abuse include sexually transmitted illnesses, urogenital and anogenital trauma, and unwanted pregnancy. Athletes are frequently silenced by the harassment and abuse process.48 ,161 In addition, passive attitudes/non-intervention, denial or silence by people in positions of power in sport (particularly bystanders) and lack of formal accountability all create the impression for victims that such behaviours are legally and socially acceptable, and that those in sport are powerless to speak out against them: this bystander effect can compound the initial psychological trauma.45 ,62 ,162 ,163 Athlete survivors of non-accidental violence may conceal their distress to maintain their position on the team or to preserve anonymity. The interaction of perpetrator methodology, silencing, isolation, bystander inaction, organisational denial and powerlessness also contribute to athlete non-disclosure. Certain organisations, especially in the education sector, have made strenuous efforts to control or eliminate such problems (see below). Nevertheless, the prevalence data reported above indicate that these issues have a strong cultural grip on sport. Despite this, many survivors recover to a positive state of mental health and resume normal lives, including sport roles. From an organisational perspective, the impacts of harassment and abuse represent asset depreciation. 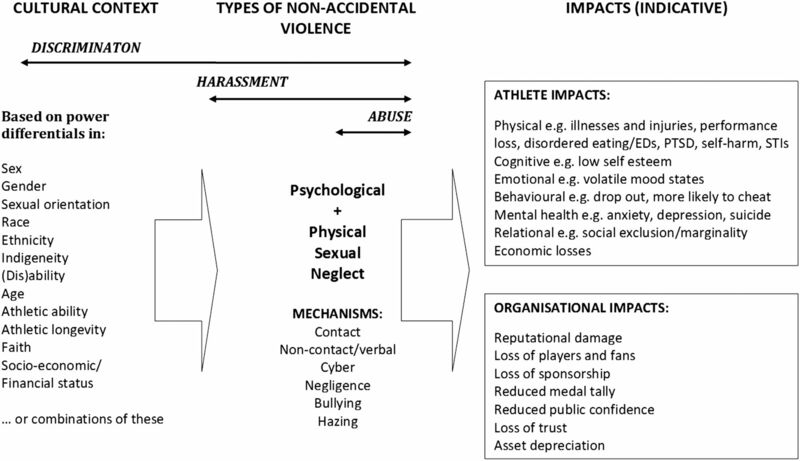 The economic impact of non-accidental violence to athletes on sport organisations is also considerable (see figure 1). When athlete disaffection resulting from harassment or abuse leads to drop-out/attrition, this represents not just a loss of potential medals but also an opportunity cost for sport organisations, the talent pool of which consequently gets depleted. Further, the reputational damage caused by adverse publicity of cases of harassment or abuse sometimes leads to the termination of sponsorship contracts.45 It also undermines the confidence and trust that athletes, their entourages, families and fans place in sport administrators. To reduce tolerance and prevent abuses, a systematic multiagency approach is most effective.4 ,6 ,185 ,186 This includes reviews of law enforcement strategies, culturally tailored education for athletes, parents, athlete entourage, fans, sponsors and sports administrators, and implementation of policy and procedures within the sports community. Any initiative aiming to prevent harassment and abuse should take into account the particular cultural context of the country and the sport. As part of this effort, personnel should avoid commodifying athletes at the expense of their human rights, since this will ultimately undermine athlete—and thus sport—integrity and security.187 ,188 Sport personnel involved in athlete development and performance have a particular responsibility to operate within professional boundaries, to understand, identify and refer signs of harassment and abuse, and to mitigate associated risks.18 Yet ignorance, denial and resistance among sports leaders—and even athletes themselves—is often a challenge to risk mitigation and prevention. Understandably, they may be reluctant to acknowledge that harassment and abuse occur in their organisations.45 ,189 Denial allows the underlying causes of harassment and abuse to persist, and the interpersonal correlates of these behaviours to proceed unchecked; thus, it is critical to build and disseminate awareness of the widespread and serious nature of abuse, and its consequences, including health or medical implications. Unless specially trained and qualified in this field, entourage members should not attempt to evaluate or treat athletes alleging harassment or abuse but should refer all disclosures to relevant experts in social work, counselling or medicine, for further physical and/or psychological investigation and treatment.79 Allegation investigation should be referred to the relevant resources in the community. If criminal activity directed towards a minor is suspected, then it is also necessary to involve law enforcement agencies as soon as possible. However, while non-accidental violence often manifest as health or medical issues, the context in which they arise is social and these social factors should therefore be addressed, in the first instance, through prevention efforts. To avoid an overly narrow focus on the psychopathological aspects of these problems it is important for sport stakeholders to understand wider societal risk factors for harassment and abuse. These include the power imbalances associated with hierarchical and heteronormatively masculine authority systems of sport that lead to a culture of secrecy and deference that facilitates abuse.48 ,59 ,190 Power imbalances may also lead to intense selection rivalries among peer athletes, which can result in both prosocial and antisocial behaviours. The evidence set out above demonstrates the urgency with which sport authorities need to develop and implement clear and effective remedies for all types of non-accidental violence against athletes. It also undermines the prevailing assumption ‘that teams are exemplary sites for human interaction’.229 Sport, like all other social institutions, is no stranger to harassment and abuse, yet it has been slow to develop appropriate responses and prevention programmes. Ever since the first Consensus Statement on Sexual Harassment and Abuse was issued by the IOC, there has been exponential growth in public disclosures, and awareness of cases of harassment and abuse against athletes. All ages and types of athletes are susceptible to these problems; however, science has confirmed that the risks are highest among elite, disabled, child and LGBT athletes, and that psychological abuse is at the core of all other forms. As well as being victims, athletes can also be perpetrators. The sociocultural precursors of harassment and abuse are based on entrenched prejudices that are expressed through power differences, and use a range of interpersonal mechanisms. Much more research is needed to protect athletes of all ages and impairments.121 Such research should include prevalence of all forms of non-accidental violence in countries for which there are currently no data; the gendered nature of violence; mechanisms of disclosures and responses to violence; violence prevention methods; safe sport advocacy and effectiveness (what works, from team selection to postgames review); and athlete consultation methods. However, action to ensure safe sport need not wait for these studies. Everyone involved in sport, not least the athletes themselves, will benefit from ‘safe sport’. It is incumbent on all stakeholders in sport to adopt general principles for safe sport101 ,169 ,170 as well as to implement the following recommendations without delay in a culturally respectful and sensitive manner. Provide details of where to seek advice and support for all parties involved in a referral or complaint. Deliver an education programme for all main stakeholders about how to engage in the practicalities of preventing non-accidental violence to athletes. Appoint or work with qualified, designated personnel responsible for safe sport programming and athlete welfare. Listen to the voices of athletes in decision-making about their own protection. Foster strong partnerships with athletes' parents/caregivers to promote safe sport. Partner with expert groups and stakeholders to follow a systematic multidisciplinary, multiagency approach. This may include law enforcement, media, medical, child protection, counselling and support or other groups. Know your rights and responsibilities with regard to the prevention and reporting of non-accidental violence. Identify your support systems among and beyond entourage members. Support your peers and encourage them to speak out if they witness or experience non-accidental violence. Negotiate for a voice in decision-making about your own protection. Effectively and appropriately respond to disclosures of non-accidental violence. Ensure that you have access to a multidisciplinary professional support team prior to initiating any treatment plan for athletes who are survivors of non-accidental violence. Know where and how to refer disclosures or suspicions. Grow the scientific evidence base about the prevalence, incidence and prevention of non-accidental violence to athletes. Engage in and promote knowledge transfer to apply scientific findings to ‘real-life’ sport settings. The enormous cultural power of the major sport agencies (eg, IOC, International Paralympic Committee, International Federations and National Olympic Committees, among others) offers them an opportunity to demonstrate leadership by implementing these recommendations. This, in turn, should both prevent non-accidental violence against athletes and embed a safe, welcoming and respectful sport environment for all. The IOC authors wish to acknowledge the IOC Working Group on the Prevention of Harassment and Abuse in sport for their supportive attendance and valuable contributions at the Consensus meeting as well as to the editing of the final document. Most importantly, the authors wish to thank this IOC Working Group for their leadership and advocacy activities aimed at promoting safe sport, free from harassment and abuse for all participants (Prince Feisal Al-Hussein and Andrea Carksa-Sheppard—IOC Women and Sport Commission; Dr Margo Mountjoy—IOC Medical Commission; Pedro Yang—IOC Entourage Commission and IOC Athletes’ Commission; Dr Cheri Blauwet—IPC Medical Commission). A special thanks to Sebastian Cruz for assistance with final editing.
. The encyclopaedia of sports medicine: an IOC Medical Commission publication. Lausanne, Switzerland: International Olympic Committee Medical Commission, 2008.
. Violence and abuse prevention in sport. In: Walsh K, Zwi K, ed. The prevention of sexual violence: a practitioners’ sourcebook. Holyoke, MA: NEARI Press, 2010:401–13.
. Protecting children from violence in sport; a review from industrialized countries. Florence: UNICEF Innocenti Research Centre, 2010. Education NAfSaP. Physical activity used as punishment and/or behavior management: position statement. Reston, VA, USA: 2009. ICES. Safeguarding youth sport: stimulating the individual empowerment of elite young athletes and a positive ethical climate in sport organisations. Belgium: International Centre for Ethics in Sport, 2015.
. The pushy tennis dad and the drugs in the drink. The Guardian, 2006.
. Challenging modern sports’ moral deficit; towards fair trade, corporate social responsibility and good governance in sport. J Commun Health Sci 2010;5:1–9.
. Participation in college sports and protection from sexual victimization. Int J Sp Exerc Psychol 2008;6:427–41.
. Performance level and sexual harassment prevalence among female athletes in the Czech Republic. Women Sport Phys Act J 2010;19:26–32.
. Life story research in sport: understanding the experiences of elite and professional athletes through narrative. London, UK: Routledge, 2014. IOC. Olympic charter: in force as from 2 August 2015. Lausanne, Switzerland: International Olympic Committee, 2015.
. The IOC consensus statement: beyond the female athlete triad—Relative Energy Deficiency in Sport (RED-S). Br J Sports Med 2014;48:491–7.
. IOC Consensus Statement on sexual harassment & abuse in sport. Int J Sport Exerc Psychol 2008;6:442–9. UNCRPD. United Nations convention on the rights of persons with disabilities: resolution adopted by the general assembly. New York, NY, USA: United Nations, 2007. UNCRC. United Nations convention on the rights of the child: resolution adopted by the general assembly. Geneva, Switzerland: United Nations, 1989.
. Making the team: inside the world of sport initiations and hazing. Toronto, Canada: Canadian Scholars’ Press, 2004.
. World report on violence against children. Geneva, Switzerland: United Nations, 2006.
. Sexual abuse and the grooming process in sport: learning from Bella's story. Sport Educ Soc 2015. (In press).
. Human rights in youth sport: a critical review of children's rights in competitive sport. London, UK: Routledge, 2005.
. Sport, civil liberties and human rights. London, UK: Routledge, 2006.
, eds. Sport, children's rights and violence prevention: a sourcebook on global issues and local programmes. London, UK: Brunel University Press, 2012. UNCRC. Optional protocol on the convention of the rights of the child on a communications procedure: adopted by the general assembly. Geneva, Switzerland: United Nations, 2011., 2011.
. The dome of silence: sexual harassment and abuse in sport. London, UK: Zed Books, Ltd., 2000.
. Spoilsports: understanding and preventing sexual exploitation in sport. London, UK: Routledge, 2001.
. Protocol design for large- scale cross-sectional studies of sexual abuse and associated factors in individual sports: feasibility study in Swedish athletics. J Sports Sci Med 2015;14:179–87.
. The forbidden acts: prevalence of sexual harassment among university female athletes. Afr J Phys Health Educ Recreat Dance 2014;20:974–90.
. Incidents of sexual harassment in Turkey on elite sportswomen. Sport J 2007;10:1–10.
. Prevalence of Male sexual harassment among female sports participants in Greece. Inquiries Sport Phys Educ 2009;7:288–96.
. Assessing the sociology of sport: on sexual harassment research and policy. Int Rev Sociol Sport 2015;50:437–41.
. Idrættens Illusoriske Intimitet (The Illusion of Sport Intimacy) [Doctoral Thesis]. In press, 2004.
. Gender based violence in Zambian sport: prevalence and protection. Oslo, Norway: Norwegian Olympic and Paralympic Committee and Confederations of Sports, 2015.
. The experiences of children participating in organised sport in the UK. London, UK: National Society for the Prevention of Cruelty to Children, 2011.
. The perceptions and occurrence of sexual harassment among male student athletes with male coaches. Afr J Phys Health Educ Recreat Dance 2010;16:S49.
. Sexual violence experienced in the sport context by a representative sample of Quebec adolescents. J Interpers Viol 2015:1–21.
. The negative behaviors of coaches: “Don't be this guy!” Phys Educ 2013;70(1):1.
. Behind the mask of glory: combating child abuse in Olympic boarding schools. George Washington Int Law Rev 2015;47:353.
. The role of hostile and instrumental aggression in sport. Linguist Philos Investig 2014;13:170.
. The causes of violence in sport: who is to blame? In: Brackenridge CH, Kay T, Rhind D, eds. Sport, children's rights and violence prevention: a sourcebook on global issues and local programmes. London, UK: Brunel University Press, 2012:18–24.
. Negligent liability in sport. QLD, Australia: Bond University, 2005. IOC. Olympic movement medical code. Lausanne, Switzerland: International Olympic Committee, 2009.
. Key themes and integrity threats for elite sport. London, UK: National Society for the Prevention of Cruelty to Children, 2015.
. Female and male athletes’ accounts and meanings of sexual harassment in Canadian interuniversity athletics (Doctoral dissertation). In press, 1995.
. Sport's officials’ reports of hearing trash talk and their responses to trash talk. J Sport Behav 2012;35:78–93. ACMA. Internet use and the social networking by young people. Australian Communications and Media Authority, 2008.
. Using technologies safely and effectively to promote young people's wellbeing: a better practice guide for services. NSW, Australia: NSW Centre for the Advancement of Adolescent Health (Westmead) and the Young and Well Cooperative Research Centre (Abbotsford), 2012.
. The dangers of cyberbullying. N Am J Psychol 2014;16:595.
. Revisiting the digital divide: generational differences in technology use in everyday life. N Am J Psychol 2014;16:557.
. ‘#Cyberviolence: developing a typology for understanding virtual maltreatment in sport. In: Rhind D, Brackenridge CH, eds. Researching and enhancing athlete welfare. London, UK: Brunel University Press, 2014:34–43.
. Cyberbullying an issue for sport. Sport Coach 2014;30. UKCCIS. UK Council for Child Internet Safety (UKCCIS). UK, 2015.
. How Tweet it is: a gendered analysis of professional tennis players’ self-presentation on Twitter. Int J Sport Commun 2012;5:461–80.
. Look who's talking—athletes on Twitter: a case study. Int J Sport Commun 2010;3:501–15. UKCCIS. Child safety online: a practical guide for parents and carers whose children are using social media. London, UK: United Kingdom Council for Child Internet Safety, 2015.
. Safe4athletes: survey on types of harassment in sport Colorado springs. CO, USA: United States Olympic Committee, 2015 (cited 9 July 2015).
. New perspectives on bullying. London, UK: Jessica Kingsley Publishers, 2002.
. Bully/victim problems among schoolchildren: basic facts and effects of a school based intervention program. In: Pepler D, Rubin K, eds. The development and treatment of childhood aggression. Hillsdale, NJ, USA: Erlbaum, 1991:411–48.
. Do you care? No bullying in upper secondary school: guidelines for school management and staff. In: Education Df, ed. Oslo, Norway: Norwegian Government, 2005.
. Go out and play: youth sports in America. East Meadow, NY, USA: Women's Sports Foundation, 2008.
. Out on the fields: the first international study on homophobia in sport. Epub: Repucom, 2015.
. MCA. Hazy viewpoints: administrators’ perceptions of hazing. Int J Sport Manag Mark 2010;7:119–31.
. Researching British university sport initiations (Doctoral Thesis). In press, 2011.
. Wrongs of passage: fraternities, sororities, hazing and binge drinking. Bloomingtom, IN, USA: Indiana University Press, 1999.
. Prosocial and antisocial behaviour in sport: the role of coaching style, autonomous vs. controlled motivation, and moral disengagement. J Sport Exerc Psychol 2011;33:527–47.
. Reply to “a conversation (re)analysis of fraternal bonding in the locker room”. Sociol Sport J 2001;18:339–44. CPSU. International Safeguards for Children in Sport. NSPCC, 2014.
WHO. Adolescent development. In: Maternal n, child and adolescent health, ed. Geneva, Switzerland: World Health Organization, 2015.
. Sexual consent. Boulder, CO, USA: Westview Press. 1998. UNPRPD. UNPRPD Fund Annual Report. UN Partnership to Promote the Rights of Persons with Disabilities, 2015.
. Violence and abuse in the lives of people with disabilities: the end of silent acceptance? Baltimore, MD, USA: Paul H. Brooks, 1994.
. Different. Just like you: a psychosocial approach promoting the inclusion of persons with disabilities. Copenhagen, Denmark: International Federation of Red Cross and Red Crescent Societies, 2015.
. The sexual abuse interview for those with developmental difficulties. Santa Barbara, CA, USA: James Stanfield Company, 1995.
. Protecting disabled children and adults in sport and recreation—the guide. Leeds, UK: The National Coaching Foundation, 1999.
. Homophobia in sport: fact of life, taboo subject. Can J Women Coaching 2006;6:1–13.
. Strong women, deep closets—lesbians and homophobia in sport. Champaign, IL, USA: Human Kinetics, 1998.
. Play fair. Sportsnet, 2015. CAAWS. Seeing the invisible, speaking about the unspoken: a position paper on homophobia. Ottawa, ON, Canada: Canadian Association for the Advancement of Women in Sport and Physical Activity, 2012.
. Are your kids safe? Media representations of sexual abuse in sport. In: Scraton S, Watson B, eds. Sport, Leisure and Gendered Spaces: Leisure Studies Publication No. 67, 2000:43–72.
. Interface between sport psychiatry and sports medicine. Clin Sports Med 2005;24:4.
. Working with adult athlete survivors of sexual abuse. In: Hanrahan SJ, Andersen MB, eds. Routledge handbook of applied sport psychology: a comprehensive guide for students and practitioners. London, UK: Routledge, 2010:303–12. WHO. World report on violence and health. Geneva, Switzerland: World Health Organization, 2002.
. Game over: Jerry Sandusky, Penn state, and the culture of silence. New York, NY, USA: William Morrow, 2012.
. Safeguarding child athletes from abuse in elite sport systems: the role of the sport psychologist. In: Gilbourne D, Andersen AM, eds. Critical essays in applied sport psychology. Champaign, IL, USA: Human Kinetics, 2011:251–66. WADA. 2014 anti-doping testing figures report. Montreal, QC, Canada: World Anti Doping Agency, 2014. WADA. 2013 anti-doping rule violations (ADRVs) report. Montreal, QC, Canada: World Anti Doping Agency, 2013.
. Preventing the sexual abuse of young people in Australian sport. Sport Educator 2001;13:28–31.
. Sexual abuse in sport: a model to prevent and protect athletes. Child Abuse Rev 2001;20:120–33. , eds. Safeguarding, child protection and abuse in sport: international perspectives in research, policy and practice. London, UK: Routledge, 2014. Safe Sport International declaration and principles. London, United Kingdom: Safe Sport International, 2015. USOC. Working group for safe training environments: recommendations to the USOC Board of Directors. CO, USA: United States Olympic Committee, 2010. IOC. Sexual Harassment and Abuse educational program. International Olympic Committee, 2014.
. Ending violence against athletes. J Int Centre Sport Secur 2015;2:18–23. USOC. Coaching ethics code. Colorado Springs, CO, USA: United States Olympic Committee, 2000.
. Guidelines: human rights in sports. Seoul, South Korea: National Human Rights Commission for the Republic of Korea, 2011.
. ‘Extreme’ parents and sport: a socio-legal perspective. South Afr J Res Sport Phys Educ Recreation 2005;27:83–99. CBS. CBS news forty eight hours: child sexual abuse and sports: resources. A list of organizations offering important prevention information and support. CBS News, 2015.
. Sport respects your rights–the project. Wien, Austria: Sportunion Österreich, 2015. http://sport-respects-your-rights.eu/. 2015 (cited 9 July 2015). NSPCC. Child abuse in a sports setting. National Society for the Prevention of Cruelty to Children Child Protection in Sport Unit, 2015. United Nations Women. Sexual Harassment in Sport [Internet]. 2015 (cited 9 July 2015). IICSA. Independent inquiry into child sexual abuse. Australian Government, 2015 (cited 12 December 2015).
. Aggression and violence in sport: an ISSP position stand. Sport Psychol 1997;11:1–7. ASC. Play by the rules: making sport inclusive, safe and fair. Australian Sports Commission, 2015. WSI. The Sexual Harassment Task Force: brochure on sexual harassment and abuse in sport. In: International W, ed. WA, USA: WomenSport International, 2007.
. Negligent hiring in youth sports: background screening of volunteers. J Youth Sports 2010;5:9–15.
. Prevention of sexual and gender harassment and abuse in sports: initiatives in Europe and beyond. Frankfurt, Germany: Deutsche Sportjugend im Deutschen Olympischen Sportbund, 2012. SR. Sports resolutions londo. UK: Sports Resolutions, 2015. WSF. Women's sports foundation. New York, NY, USA: Women's Sports Foundation, 2015.
. Examination of a hazing workshop intervention for intercollegiate sport club athletes. Recreational Sports J 2012;36:113–26.
. Appropriate and inappropriate practices for coaching female athletes. Strateg A J Phys Sport Educ 2014;27:13–17.
. Empowered coaching Birmingham. UK: University of Birmingham School of Sport and Exercise Sciences, 2015 (cited 5 August 2015). PSA. Youth sexual abuse prevention policy and procedures mountain view. CA, USA: Positive Coaching Alliance, 2015. PSA. Protecting youth athletes from abuse: youth sports leaders mountain view. CA, USA: Positive Coaching Alliance, 2015. OMTCS. Coach's notes: preventing sexual abuse of children in sport Toronto. Ontario, Canada: Ontario Ministry of Tourism, Culture and Sport, 2015. SquashCanada. Sexual abuse in amateur sports: a guide to prevention and intervention developed for sports administrators. Sports Branch of the Ministry of Municipal Affairs in co-operation with the Communications Branch, 1994. LA84. Resource guide on preventing child sexual abuse in youth sports. In: Foundation L, ed. CA, USA: LA84 Foundation, 2015.
. An examination of the legal framework between title VII and title IX sexual harassment claims in athletics and sport settings: emerging challenges for athletics personnel and sport managers. J Legal Aspects Sport 2008;18:1–37.
. Healthy sport for healthy girls? The role of parents in preventing sexual abuse in sport. Sport Educ Soc 1998;3:59–78.
. Sexual harassment in the athletic training room: implications for athletic trainers. Athl Ther Today 2003;8:20–3. ITF. Player welfare. International Tennis Federation, 2014 (cited 8 May 2014).
. A developmental and psychoeducational approach to reducing conflict and abuse in little league and youth sports: the sport psychiatrist's role. Sports Psychiatry 1998;7:819–918. FEPSAC. Position paper # 6: sexual exploitation in sport, 2002. European Federation of Sport Psychology, 2002. USGAO. Youth athletes: sports programs’ guidance, practices, and policies to help prevent and respond to sexual abuse. In: GAO, ed. United States Government Accountability Office, 2015:418.
. Protecting athletes from sexual harassment and abuse in South Africa. In: Lang M. Hartill M, eds. Safeguarding, child protection and abuse in sport: international perspectives in research, policy and practice. London, UK: Routledge, 2014:88–96. CAS. History of the CAS Lausanne. Switzerland: Court of Arbitration for Sport, 2015 (cited 17 January 2016).
. Sport ethics in context. Toronto, ON, Canada: Canadian Scholars Press, 2007. Contributors MM and CB are first authors, and provided substantial contributions to conception and design, co-coordinators of IOC Expert Group+Consensus meeting, drafting and revising the manuscript, and approving the final version to be published. MA, KF, SK, TL, SM, KM and KS are members of IOC Expert Group and contributors at Consensus meeting, and provided substantial contribution to drafting and final revision of the manuscript to be published. CB and AC-S are members of IOC Working Group and participants at Consensus meeting, and were involved in final revision of the manuscript to be published. AT is member of IOC Expert Group and contributor at Consensus meeting, and was involved in final revision of the manuscript to be published. RB is the Director IOC Medical and Scientific Department and participant at Consensus meeting, and was involved in final revision of the manuscript to be published. Funding The Consensus meeting was funded by the IOC.